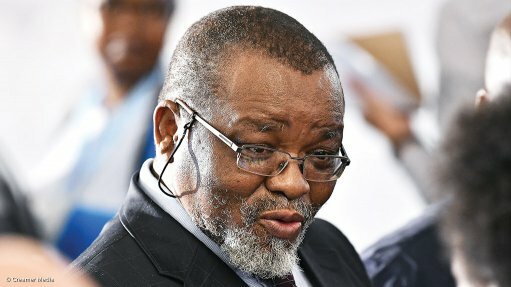 CAPE TOWN (miningweekly.com) – The coal industry needs to counter the negative attitude towards the industry by investing in clean coal technology and funding research initiatives to find alternative markets for coal, says Mineral Resources Minister Gwede Mantashe. He told delegates at the opening of the fourteenth annual Southern African Coal Conference, on Thursday, that the movement towards clean energy was moving "at breakneck speed". Mantashe called on industry leaders to be proactive in their approach, as renewable energy has started to pick up. The Minister said coal would remain a critical part of the country’s energy mix for the foreseeable future, in line with South Africa’s Integrated Resource Plan. He pointed out that coal was the biggest generator of revenue in the mining sector, ahead of gold and platinum group metals. This was despite a marginal decline in exports following heavy rainfalls in Richards Bay, which adversely affected the coal terminal last year. The coal sector also accounts for 18% of jobs in the mining industry. Mantashe said South Africa had an abundance of coal, including vast coalfields in the Springbok flats area, which has recently been studied by the Council for Geoscience (CGS). He said the CGS would undertake more detailed work in the area over the next year. While most new mines in the past two years have been located in Mpumalanga, Mantashe said the Waterberg area in Limpopo "is where the future of the South African coal industry is". The area contains more than 60% of the country’s remaining coal reserves. Mantashe said he was convinced science could find solutions to high levels of carbon emissions in the coal industry and called on industry leaders to embrace clean coal technology. Mantashe said the government had asked State entities, the South African National Energy Development Institute and CGS, to explore the prospects of applications of carbon capture and storage in South Africa. The CGS had identified five prospective basins for carbon storage. Carbon capture and storage involves capturing carbon dioxide (CO2) released from large industries and storing it underground. The advantage of such is that CO2 released from large emitters such as electricity plants, coal-to-liquid plants and cement manufacturing plants can be captured and prevented from reaching the atmosphere. Mantashe said other plans in place to tackle emissions and help the country achieve its commitment included the introduction of a carbon tax, a carbon budgeting system and compulsory greenhouse-gas emissions reporting. The Minister was also very pleased to report a decrease in the number of deaths and injuries in the mining industry overall in 2018. Mantashe also urged mining companies to engage more meaningfully with communities. He said it had become apparent that there was a gap in engagement between mining companies and the communities in which they operate. More broadly on the mining industry, Mantashe said his department was working on strengthening the online licensing system to make it easier for investors. The department recently closed three of its offices, in Mpumalanga, Limpopo and the North West for a thorough investigation. Mantashe assured delegates to the conference that the government was also looking into the challenge posed by administered prices, including port, rail and electricity tariffs, which were seen as a barrier to investment.